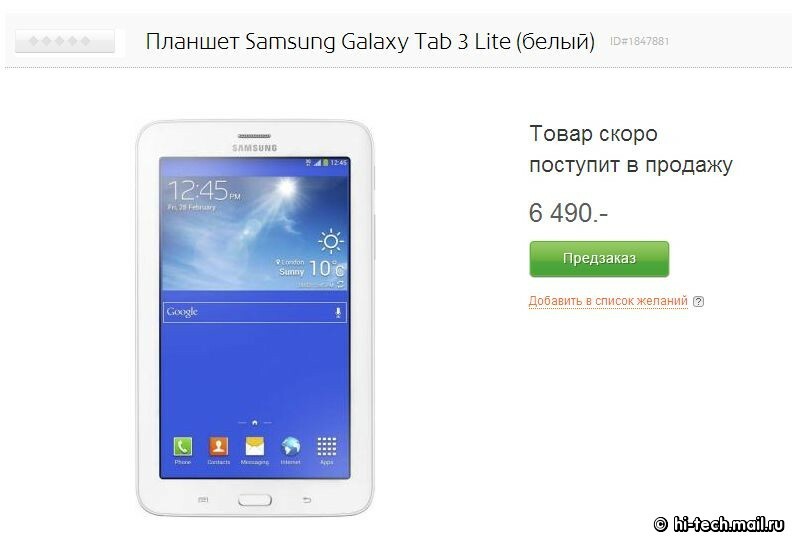 The Galaxy Tab 3 Lite was made official by Samsung last week, and now the 7-inch slate has gone up for pre-order in Russia in both black and white color options. The Wi-Fi model is priced at 6490 rubles (~$206), while the 3G model is priced at 9990 rubles (~$294) – mobile devices are usually priced a bit higher in Russia than other countries, but even then, if these prices turn out to be the final ones in Russia, it’s possible the tablet won’t be as cheap as we’re expecting it to be (100 Euro) in most countries, though it will still be the cheapest Samsung tablet out there. A launch date isn’t mentioned, though it should be available for purchase before January ends. The Galaxy Tab 3 Lite sports a 7-inch WSVGA (1024 X 600) screen, 1.2GHz dual-core processor, 1GB of RAM, 2-megapixel rear camera, 8GB of internal storage and a microSD slot, Wi-Fi 802.11 b/g/n/ (2.4GHz), Wi-Fi Direct, BT4.0, USB2.0, GPS + GLONASS, and HSPA+ 21mbps connectivity, a 3,600 mAh battery that is rated for up to 8 hours of video playback, and Android 4.2 Jelly Bean. The 3G variant can also make calls, which should come as no surprise given the presence of that capability on the Galaxy Tab 3 7.0.